See more objects with the color darkseagreen darkslategrey or see all the colors for this object. This is a Tablet computer cover. It was designed by Apple Industrial Design Team and manufactured by Apple Inc. and the design director was Jonathan Ive. It is dated 2011 and we acquired it in 2012. Its medium is aluminum, polyurethane. It is a part of the Product Design and Decorative Arts department. 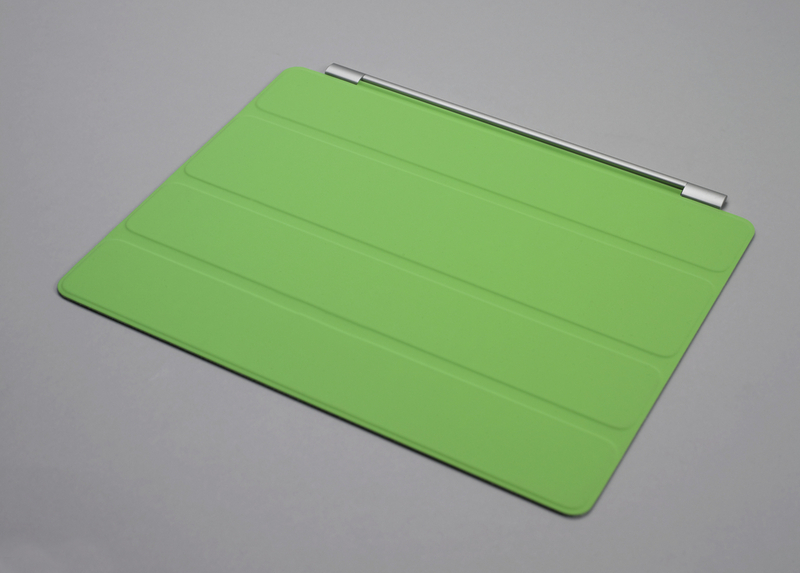 The iPad 2's Smart Cover is an innovative accessory that magnetically aligns to the face of the tablet. The cover has three horizontal creases that allow it to fold into a stand, which is also held together by magnets. While the first-generation iPad had a separate, folder-like black cover that could also act as a support, the iPad 2’s minimal Smart Cover protects the screen, is easily detachable, and cleans the screen with its microfiber interior. The Smart Cover also acts as an energy saving mechanism: the iPad 2 goes to sleep when the cover is placed over it and wakes when the cover is removed. In a nod to consumer tastes, the cover is available in a variety of colors in both polyurethane and leather. Examples of contemporary technology and industrial design are an important area of collection growth. For exhibition purposes, two Smart Covers are proposed for acquisition so that the museum can display one on the iPad 2 and the other separately.